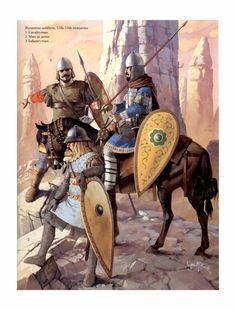 Forum Index > Historical Arms Talk > dilemma on byzantine shields, oval/kite? Posted: Tue 14 Mar, 2017 11:18 pm Post subject: dilemma on byzantine shields, oval/kite? ok heres how my dilemma goes. i am making an impression of a 10th century byzantine footsoldier, an impression that has also lead to some humming and hawing about how ill do the massive knee length standalone gambeson soldiers wore as standard. 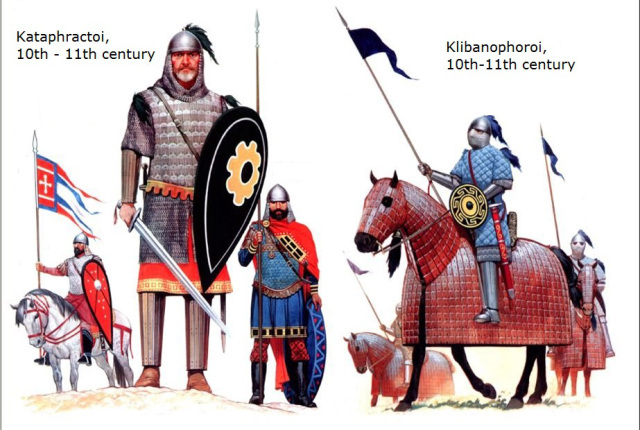 I don't know much about the Byzantines so I can't say for certain when they came into use there, but from what I've seen in Western Europe it would seem that the 10th century still saw the round shield as the primary form of shield, with the long Norman style "kite" shield taking over in the early to mid 11th century. It is certainly possible that they were used in the later 10th century, but I haven't seen anything to suggest that. Hope that helps. Please keep in mind that Osprey Books are not the best resource for historical costumes, because they frequently get particular details wrong. You are much safer looking at primary sources yourself, rather than relying on secondary sources like Osprey. Oh, I did not know they were unreliable. I apologise for mentioning them.